The name means ‘The Old Chapel’. 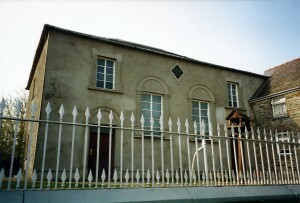 The chapel was founded in 1709, as stated on a plaque on the present building. 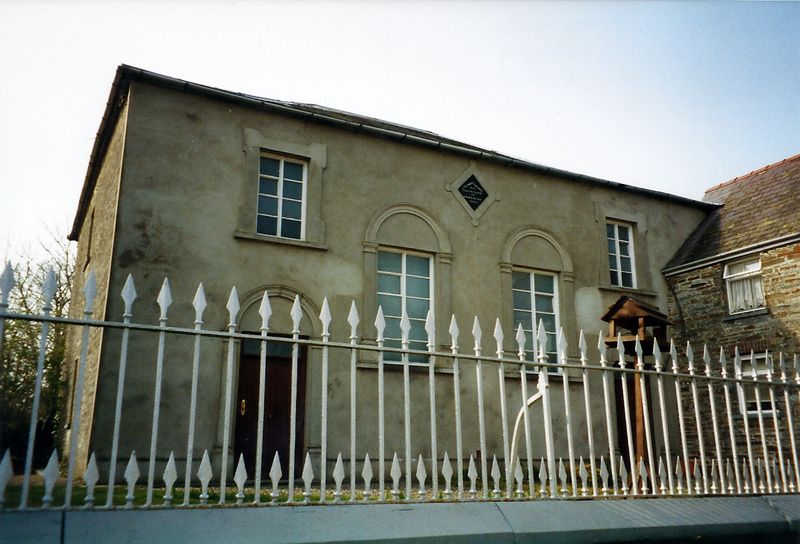 It was said by some to be the first Congregational Chapel in Cardiganshire. Rev. John Thomas of Lllwyngrawys, Llangoedmor, was the founder. The land was acquired from Thomas Lloyd of Coedmore on a 999 year lease. According to one source, Rev. John Thomas died circa 1712. In 1723, following the death of Rev. John Thomas, David Sais of Cardigan was ordained the new minister. He remained the minister until he died in 1741. During his ministry branches were formed at Brynberian, Moylegrove and Drewen. David Sais was succeeded by Rev. David Evans, his former assistant from about 1739, who was then the Minister here ca1741-73. In 1742 Mr. David Griffiths became the assistant minister to Rev. David Evans, and remained so until 1773. In 1763 the famous preacher, Howell Harries, preached to a crowd of 12,000 Nonconformists at Llechryd. Circa 1773, following the death of Rev. David Evans, Rev. David Griffiths became the minister. In 1788 Mr. Griffith Griffiths was ordained as the assistant minister. In 1794 Rev. David Griffiths died. He was succeeded by Rev. Griffith Griffiths who was the minister from 1794 until 1818, when he died. In 1818 Rev. David Davies of Neuaddllwyd became the minister, but left in 1821, having proved to be very unpopular and regarded as “…totally useless…” There was then a short periosd of strife and division over beliefs and practices. Mr. Methuselah Davies briefly had charge during this period, but was not ordained. A surprise religious census in 1884 showed 154 attending in the morning and 116 in the evening. In May 1884 Rev. Hugh Hermonydd Williams became the minister until 1926. In May 1909 the chapel celebrated its bicentenary. In 1918 the Deacons were named as: Thomas Edwards, Titus Sallis, David Lodwick, William Griffiths and James Davies. Rev. Hugh Hermonydd Williams was the minister until his death on 8th October 1926. In December 1926 an electric light was installed. In December 1927 a memorial plaque to the late Rev. Hugh Hermonydd Wiliams was unveiled here. On 8th January 1929 Rev. David Roberts was inducted as the minister. In June 1946 the chapel became licensed for the solemnising of marriages. The chapel re-opened on 4th June 1948 after a refit. On 1st February 1953 Rev. David Roberts was involved in a car accident and died on 7th February 1953. On 29th July 1955 Rev. Meirion Evans became the minister. In 1956 Mr. D. J. Thomas became a Deacon until at least 1989. In March 1960 Rev. Meirion Evans accepted a new calling to Caernarfonshire. In 1961-90 Rev. Arthur Evans-Williams was the minister. In 1970 Trefor Thomas became a Deacon until his death in 1984. In 1977 Hans Bloom-Williams, Gwilym Owen, Ivor Page and Mr. W. J. Watts became Deacons until at least 1989. There were 82 members in 1981, falling to 78 in 1982, 75 in 1983; 74 in 1984; and 73 in 1985, rising to 77 in 1986. There were 69 members in 1987. In 1989 membership rose from 66 to 67. In 1990 Johnny Owen, Laurie Davies, Mrs. Marianne Kenvyn Davies and Mrs. Tegwen Rees became Deacons. In 1990 membership fell from 67-66, in 1991 to 63 and in 1992 to 59. In 1994 there were 53 members. In 1995 membership fell from 53 to 50; in 1996 to 49, and in 1997 to 48. In 1999 Mr. D. J. Thomas, Mr. Hans Bloom Williams, Mr. Ivor Page, Mrs. Marianne Kenvyn Davies and Mrs. Tegwen Rees were the Deacons. In 1999 membership fell from 47 to 44 and in 2000 fell to 42. In 2001 Ivor Page ceased to be a Deacon, but remained the Treasurer. In 2002 membership fell from 41 to 36. In November 2003 former Minister Rev. Arthur Evans-Williams, the minister, died. In 2004 membership fell from 37 to 35. The chapel closed in 2010 and was advertised for sale before the end of the year.